Before you bring home a new little gecko, it’s important to know what to feed your pet. Like most lizards, geckos are predators that prefer to eat a variety of insects. The exact type of insects, feeding schedule, supplements, and amount of food will vary based on your gecko’s species, age, and activity level. 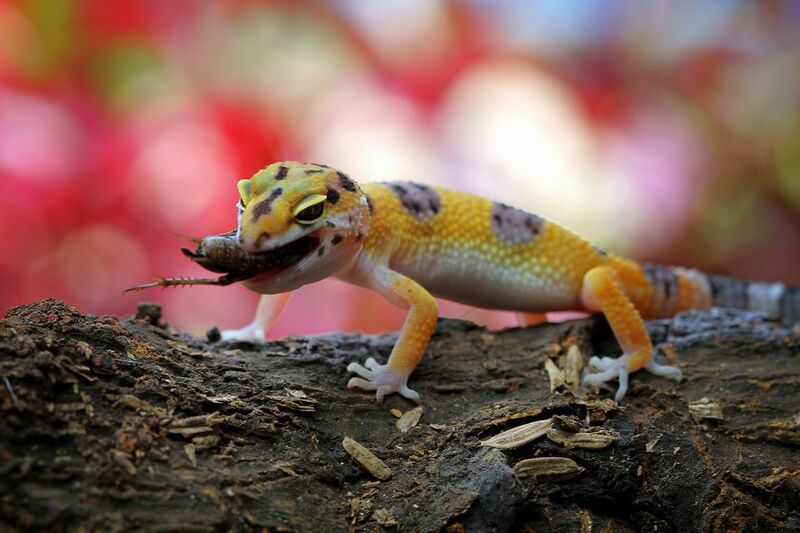 Most geckos do best eating live prey. Unlike dogs and cats, geckos don’t generally do well eating pre-packaged kibble or prepared food. That means you’ll need to purchase or breed live insects to feed your gecko. Some species of pet gecko eat fruit as well as insects. These geckos can eat pureed fruit mixes or prepared fruit mixes formulated for geckos. However, most pet geckos are primarily insectivorous, meaning they eat insects and other creepy crawlies. African fat-tailed geckos, house geckos, and leopard geckos are all purely insectivorous. Crested geckos and day geckos, however, are frugivorous. That means they eat fruit. Feed your insectivorous geckos a variety of insects. Relying too heavily on one type of insect will not give your gecko a complete diet. Crickets: These critters will form the backbone of most pet gecko diets. That’s not because they’re the healthiest—it’s just because they’re easiest to purchase or raise at home. Mealworms: Mealworms are another main staple for leopard geckos, though they might be too large for some house geckos. Waxworms and Superworms: These insects are very rich. Use them as special treats and only offer them once a week or so. Flies: These little guys are perfect for small geckos like house geckos. Fruit flies are usually easiest to find for purchase. You might find that it’s easier in the long term to raise your own crickets and insects for your geckos. Regardless, a good setup for storing insects will help you avoid going to the pet store to purchase them every few days. It’s best to avoid feeding your pet gecko wild insects—you just don’t know which ones might be toxic or covered in harmful chemicals from the outdoors. Day geckos eat a mixture of the insects listed above, especially crickets, and gecko diet mix. Similarly, crested geckos generally eat a mix of insects and powdered crested gecko food. Be sure to gut-load your gecko’s insects before offering them to him. This simply means feeding the insects an extra-nutritious diet for 24 hours before feeding them to your pet, so that your gecko gets all of the nutritional benefits! Most pet stores will sell a prepared diet to gut load your insects. Otherwise, a high-quality mix of fruits, veggies, and grains will do the trick. You can also dust your insects with a nutritious powder purchased at a pet store. Feed your frugivorous gecko fruits like grapes, apricots and apples. Puree the fruit or chop it into pieces that are smaller than the space between your gecko’s eyes. Pieces that are too big can be dangerous for your pet! You can purchase prepared fruit mixes for day geckos and crested geckos, making things a bit easier. In fact, most new gecko owners shouldn’t try to make their own fruit mix for their geckos. It’s just too tricky to track your gecko’s calcium and other health factors when you’re a new gecko owner. Most geckos are nocturnal, so it’s best to feed them at night. Otherwise, they might not be awake or hungry for feeding time! Young geckos should eat every day. As they mature, most adult geckos do best eating every other day. All geckos should have constant access to clean, fresh water. Misting the tank regularly will give your gecko the humidity he requires. The amount of food that your gecko needs will vary based on his age and activity level. Feed him as much as he’ll eagerly eat within a few minutes. You don’t want to put too many insects in his cage, as they may escape, die and rot, or tempt your gecko into overeating. Simply introduce a one or two insects at a time, slowing down as your gecko’s eagerness to eat wanes. Some geckos will happily eat from long tweezers, which can make it easier to control how many insects you put into his cage. Be sure to clear out any uneaten fruit mix or insects after your gecko is done eating. Both fruit and insects can rot, creating an unclean environment for your pet. What Do Pet Hedgehogs Eat?